The Al Ain Zoo in the UAE is a great place to visit because you will not feel sympathetic towards the animals living in its enclosed grounds. Established in 1969 on a 400 hectare park close to the base of Jebel Hafeet, the Al Ain Zoo is the home for a large collection of animals from around the world. There are over 4,000 animals at the site with 180 species, some of them endangered. You will find various sections inside the zoo; there is a large area featuring wild cats where you will come face to face with lions, pumas, leopards and jaguars. Different species of reptiles are also found in the dedicated space for these slithery serpents. You will find some “monkey business” going on at the compound dedicated specifically for apes! There are myriad of fish and sea creatures that one will be able to see at the aquarium and different varieties of feathery friends roam around at the bird aviary of the zoo. The atmosphere of the site resembles the natural habitats of most animals staying here, with plenty of greenery and public spaces for picnics and relaxing. Children can have some fun at the playgrounds available and you can enjoy a meal at the cafeteria at the site. Train tours are also organized within the wildlife section of the zoo. 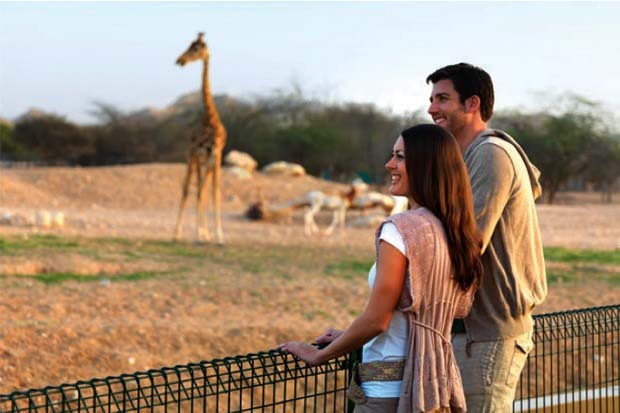 There are several interactive activities also available for visitors such as giraffe feeding, camel rides and petting certain animals at the ‘Elezba’. Visitors are allowed to feed the giraffes five times a day with certain vegetables that are served by the staff and you can spend time petting the sheep, goats, camels, lamas, chicken or ducks at the Elezba as well. The dinosaur trail at the site is also an interesting component where you will find 15 – 20 mechanical dinosaurs with sensors such as the imposing T-Rex. Interesting facts about dinosaurs such as their habitats, diet and other features are available at this section as well. If you are planning to visit UAE find accommodation at an Abu Dhabi resort such as the Desert Islands Resort & Spa by Anantara which is a paradise for holidaymakers. With close proximity to well known tourist attractions but perfectly nestled away from bustling city life, this is one of the best Abu Dhabi beach hotels.